The title of this post to some may seem contradictory, in that waking up is one thing but waking up happily is in itself entirely different, if not impossible. This I understand, things such as lack of sleep, lack of motivation or even simply not having an interest in what it is that you’re waking up early for, can all make those early mornings dreadful. But it doesn’t have to be that way at all, despite society’s conditioning of what I like to call Monday phobia, mornings don’t have to be dreadful, they don’t have to be something that just ruins the entire day, by putting in that extra effort to keep healthy habits, they can provide a good foundation for the rest of the day. I’m sure you all know the saying, breakfast is the most important meal of the day, ever since I published my post on how my ideal day would be like, I’ve realised how much I need to feed myself something nutritious and healthy. In terms of mental health, it really is no different so the saying would change to: the morning is the most important part of the day (I know this may be different for people who identify as night owls etc). But to make the morning as successful and productive as you envision it to be, the planning starts the night before. Just as I mentioned, having an idea, the night before, of what your schedule will be like, or what errands you to have to run, or making either a mental or physical note of the day ahead is very important. It means the next morning will start off in a more peaceful manner because you will already know how the day will be like, you’ll be less stressed and more in-the-know of what it actually going on, instead of being in somewhat of a blank state. Establishing a routine the night before is also important because despite all the technological distractions and the jumping from app to app or scrolling endlessly for hours, which I’m sure we’re all guilty of, we can control how the next morning will turn out. By taking out the time to relax both physically and mentally, like taking a warm bath/hot shower with scented products or even essential oils, and journaling or meditating, your mind and body will then, over time, understand the cues and begin to relax. For me, a night routine is when I like to treat myself as well by using face masks and having a hot shower, I also meditate for around 10 minutes so that by the time I fall asleep I am fully relaxed, which means I stop overthinking about everything. In my own experiences, you can have a perfect night routine that includes both relaxation and planning, but if you don’t have a why, you’ll never get up. 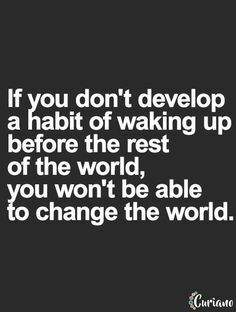 It’s as simple as that, if you don’t have an intention, a reason, a purpose for waking up early in the morning you just won’t. We all need a purpose that’s stronger than the drowsiness of sleep, the warmth of our beds and the drooping of our eyelids. Over time this will happen out of habit or even out of discipline, but first, we need a why. For me, the why is the fact that this year I’m working as an honorary assistant psychologist so I have a lot of opportunities to meet patients, help them with recovery and be of assistance to many people. My why is that my work is important to me, and makes me happy. This may seem like a no-brainer but it’s definitely worth repeating anyway. What works for someone else may not work for you, and what works for you may not work for someone else. It’s down to you, you have the choice to wake up early, you have the choice to be happy, to be sad or any other possible emotion. You need to be motivated, to have a why, and if something stops working for you, instead of giving up and feeling dejected by it, you can try something new. This is a really helpful list! I just woke up at 7am but my trick to waking up early is drinking lots of water a few hours before. I don’t got to explain why.